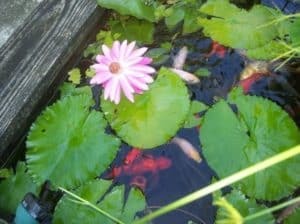 When you’re thinking of installing a garden pond or a fish pond, you might be wondering about the type of plants and decorations that you should be using. What you choose can make a big impact on the ecosystem in your pond, so it’s fairly important to have a think about what you are using your pond for, what kind of fish you will have in your pond, and whether you are going to have a natural pond, or use a plastic-based pond. The type of plants that you choose will depend on the type of pond you have. If you have a more natural pond that is dug into the ground, bog plants are a great option. These plants are perfect for growing in damp muddy areas, so a great choice for around the outside of the pond. For colour, choose bog plants such as Day Lilies, Ajuga and Goat’s Beard while mint and ferns will provide great green coverage. Plants provide optimal hiding and breeding spots for any fish in your pond, which is important especially in the hotter parts of the day or if birds and other wildlife come and use your pond to drink or cool down. Floating plants provide plenty of shade and hiding spots and with their roots suspended in the water, they use nutrients to help suppress the growth of algae. Fish will also use the root masses of plants such as duckweed, Water Lettuce and floating moss as a spawn point in the pond. Other options for plants include oxygenators which help absorb minerals in the water that would normally feed algae. These plants help the water stay cleaner and include options such as water lilies. Marginal plants are great for potted options and include Japanese Iris, Umbrella Grass and Fishbone Water Fern. The types of plants you choose should compliment the type of pond you have or are planning to install. By choosing the right mix of plants, your pond will stay cleaner for longer and will have a great ecosystem providing a healthy place for your fish to live.